Widely renowned manufacturer of sealants and adhesive for a variety of applications. A fast curing, polyurethane-based adhesive/sealant. It is a moisture-cured, non-sag system. Provides a permanent elastic bond to fasten materials. Tack-free Time: 45 minutes Application Temperature: 40° F. to 100° F. Cures rapidly and is sand able. Resistant to shock and vibration dampening. Can be painted with water, oil, and rubber based coatings. Odourless, non-staining, non-corrosive, and non-shrinking. Excellent on aluminium, GRP, steel, wood, and pre-painted metals. 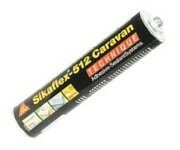 Sikaflex 512 is a combined adhesive and sealant for caravans, motorhomes and trailers. Ageing, UV and weather resistant, Sikaflex 512 creates a strong bond and a flexible waterproof seal which does not harden, cack or degrade over time.